Sometimes it’s the little things in life that can bring us the most joy, such as a steaming cup of hot tea and a homemade sugar cookie with buttercream frosting and sprinkles. 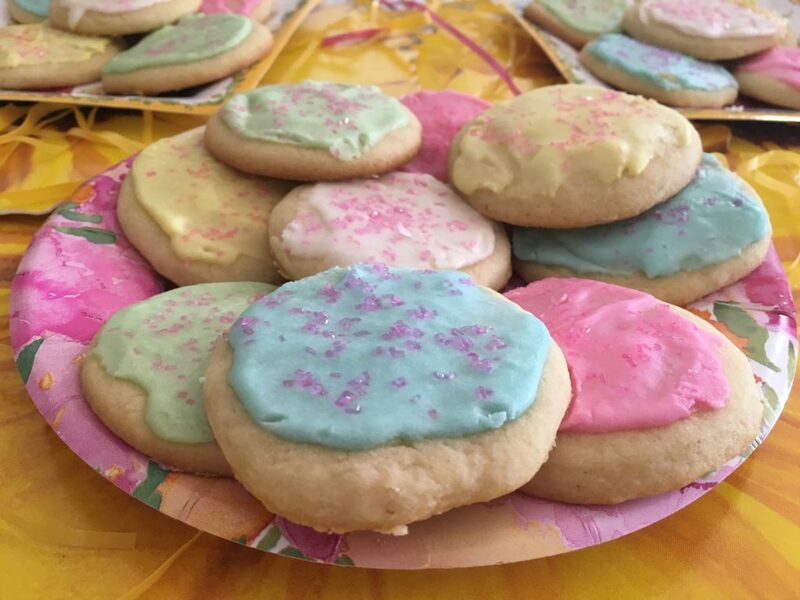 Below are three recipes for sugar cookies, two of which are plain old-fashioned recipes with basic simple ingredients, while the third recipe adds a couple of twists and turns to a basic recipe, giving it a little extra dash of ultimate spring flair! Sift together the flour, baking powder, and salt, and set aside. In the large bowl of an electric mixer cream the butter. Add the vanilla and sugar and beat well. Beat in the eggs one at a time and then add the milk. On low speed gradually add the sifted dry ingredients, scraping the bowl as necessary with a rubber spatula and beating only until thoroughly mixed. Divide the dough in two and wrap each half separately in wax paper or aluminum foil. Chill the dough in the refrigerator for at least 3 hours. Place one piece of the dough on a lightly floured pastry cloth. Turn it over to flour all sides and form it into a ball. With a floured rolling pin, roll the dough to the desired thickness: For very large cookies roll to a generous 1/4-inch. Cut the cookies as you wish. With a wide metal spatula transfer the cookies to unbuttered cookies sheets. Sprinkle with tops of cookies generously with extra sugar. Bake for 8 to 12 minutes (depending on the size of the cookie) or until the cookies are lightly browned, reversing the position of the sheets top to bottom and front to back as necessary during baking to ensure even browning. Cream butter and sugar. Beat in eggs and vanilla. Add remaining dry ingredients. Chill dough at least 2 hours. Remove from refrigerator and let come to room temp. Roll cookies out on wax paper, sprinkled with flour to the thickness you like (we do about a little over 1/8″). Cut with cookie cutter. Bake in 375-degree oven for 8-10 min. or until edges slightly turn brown. Let cool before frosting with butter frosting. Cream butter and then add half of the sugar along with half of the milk combining slowly; add the remaining sugar and milk a little at a time. Stir in the vanilla – and voila! Add a touch of food coloring if desired. Spread on cookies and add some sprinkles for a festive touch! Combine the flour, baking powder, baking soda, and salt together into a medium bowl. Whisk 1 & 1/2 cups of the sugar, the cream cheese, and the warm melted butter together in a large bowl until the cheese softens and the mixture is smooth. Add the oil, egg, buttermilk, and vanilla and whisk again. Gradually stir in the flour mixture to make a soft dough. Using about 2 tablespoons for each one, roll the dough into twenty-four 1 & 1/2-inch-diameter balls. A few at a time roll the balls in the sugar to coat. Place about 1 & 1/2 inches apart on the prepared baking sheets. Use the flat bottom of a drinking glass or a wide metal spatula to press each ball into a 2-inch-diameter disk. Sprinkle the tops with the remaining sugar. Bake for 6 minutes. Rotate the baking sheets from the top to bottom and front to back, and continue baking just until the cookies are beginning to brown around the edges, about 6 minutes. Let cool on the baking sheets for 5 minutes. Transfer cookies to wire racks and let cool completely.